Easy Cheesy Chicken Enchiladas Recipe: Fast & Flavorful in Minutes! 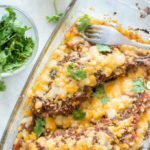 This easy cheesy chicken enchiladas recipe is one of the best chicken recipes and perfect for everything from weeknight dinners to entertaining. Since Cinco de Mayo falls on a weeknight this year, I wanted an easy Mexican food recipe to serve up. Tacos or quesadillas were an obvious choice but something we have all the time. Instead, to celebrate, I wanted something a little more authentic and a little more festive. Even though it was just us, I knew exactly what to make…my Easy Cheesy Chicken Enchiladas. 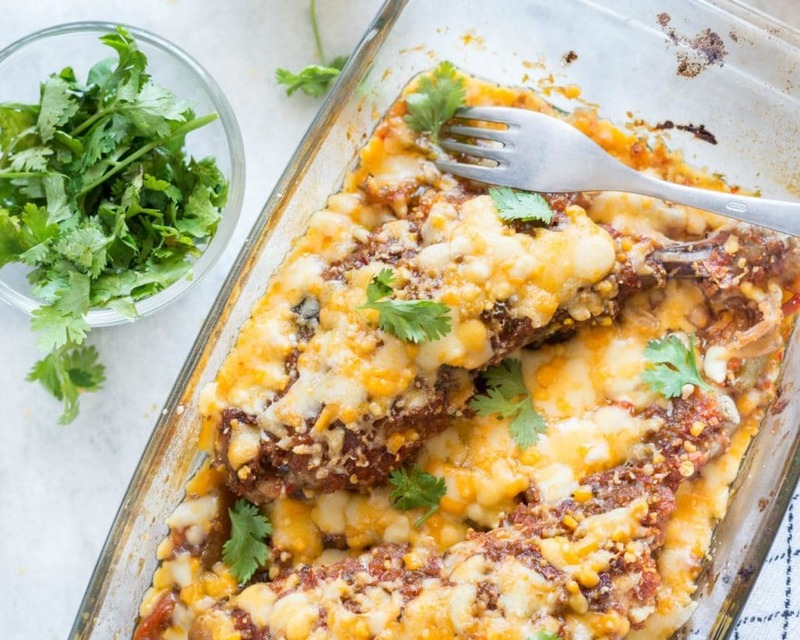 This chicken and cheese enchiladas recipe is such an easy impressive meal. Everyone is always surprised to see how quickly it comes together and how little culinary skills you need to pull this off. I love it because it’s filling, flavorful, festive, and always a crowd pleaser. If you want to get on your mother-in-law’s good side, make her this and you’ll be in her good graces. Trust me, I made this the first time I met my in-laws and it totally worked! This is what you will need to have on hand to make your own enchiladas at home. You might already have most of it! If you don’t have time to cook everything from scratch, here are some helpful tips that will save you a ton of time and still make them taste just as amazing. so I don’t have to haul out the big guns for just two chicken breasts). Having the chicken already cooked (and cool enough to shred immediately) will cut your prep time in half. Watch out using the food processor though, if you’re not careful you’ll shred the chicken too finely and completely throw off the texture of the dish. Another shortcut you could make in preparing this chicken enchilada casserole is to use canned chicken. I’ve done this before when I haven’t had a chance or forgotten to thaw a chicken breast. It’s not ideal and the flavor will be a little off, but if you were in a pinch it does work. I don’t know about you but I love to load up my enchiladas with lots of toppings! One of my favorite tricks I’ve learned for ensuring all that goodness stays in place is using a pan like this one instead of a typical baking dish. Enchiladas don’t always have the best presentation, but I assure you that if you serve them in this it’ll not only look amazing it might taste just a tiny bit better too. What is better for chicken enchiladas – red or green sauce? My family absolutely loves the red sauce on chicken enchiladas. But there are some people that say the red sauce is for beef and the green sauce is for chicken. Try the red sauce first. I bet you’ll love it as much as my family did. But then, just for fun, try the green sauce at your next meal. You might like it too. The difference between the red and green enchilada sauce is which chilis it’s made of – red sauce is made with red chilis and green sauce is made with green chilis. Some green enchilada sauces have tomatillos in them. The taste differences tend to be pretty minute. Red chilis are a bit riper so they taste a tad sweeter. Corn or Flour Tortillas for Enchiladas? Traditionally, enchiladas are made with corn tortillas that are dipped in hot oil before rolling. This makes them extra crispy out of the oven. However, to save time, I used flour tortillas. Using flour tortillas will change the texture. They will be softer, but flour tortillas are much easier to roll up. If you don’t have much time, use flour tortillas. If you have time and want the authentic crisp, use corn tortillas. The trick to making corn tortillas easier to roll, (because they will break if you use them right out of the package) is to heat them up first. Either heat them in oil or zap them in the microwave. Ready for a super quick dinner recipe your family will love? Jazz up your taco Tuesday with my chicken enchilada recipe! Place chicken in large pot of salted water and bring to a boil. Meanwhile, preheat oven to 350 degrees and spray a 9x13 baking dish with nonstick spray. Continue boiling chicken until it is cooked through and no longer pink. Remove chicken from water and shred in food processor or you can shred the chicken by hand using a fork. Lightly season chicken to taste with salt and pepper. Open all cans of enchilada. Set two cans to the side and pour one can in bottom of prepared baking dish. To begin assembling enchiladas, take one flour tortilla and coat both sides with enchilada sauce from bottom of baking dish, add a heaping spoonful of refried beans, 1/8 of total chicken prepared, 2T diced onions (we like a lot of onions but you could use less and still get great results), lightly drizzle contents with enchilada sauce from can (1/8 of can). Repeat step 6 until all enchiladas are filled with bean/chicken/onion/sauce mixture. Pour remaining can of enchilada sauce over all enchiladas and then top with cheese. Bake in preheated oven for 30 minutes or until cheese is melted and starting to brown. Serve alone or with optional toppings above for even more flavor! My chicken enchiladas make a fantastic freezer meal. So prepare a double batch and put half of them in the freezer for one of those days when you just don’t have time to cook. To freeze, you’ll need to prepare them in an aluminum baking pan. Then, cover them with plastic wrap first, then top with aluminum foil. They will stay good in your freezer for up to 3 months. To bake them, just take off the plastic wrap and cover them back up with foil, then bake for 30 minutes. Uncover; bake for an additional 5-10 minutes, or until completely cooked through. If you make this recipe, I’d love to know what you think! This is one of the first and easy Mexican food recipes I learned to cook when I got married and is one of my go-to recipes when having people over for dinner. After making this recipe, you’ll never order chicken enchiladas from a restaurant again. Since I’m a huge fan of cheesy recipes like I am, you’ll want to try this salad to go with lasagna! Need more easy recipes that will feed your family without taking too long to make? Here are some of my favorite easy family meals. « Get Ready for Waterproof Makeup Season: Homemade Eye Makeup Remover Recipe! it really is easy! and cheesy! reading your recipe made me hungry. so i must try it! thx! Yum! I am overdue to make enchiladas. Thanks for the recipe! It looks delicious! I love chicken enchiladas, one of my fave things. I'm stumbling it for ya! I think we will try these. Thanks for sharing! These are so easy to make, aren't they?? I don't put all these ingredients in mine but gosh…. I think I need a little Mexican soon. yum, I did an enchilada post today as well! This sounds good. mm I like Chicken Enchiladas! I think I like beef ones better, but I still need to try this! These look awesome! Your title has “Easy” in it. Enchiladas have never been easy for me. I always have a hard time keeping them from getting mushy in the oven. But then, I haven’t tried in a long time either. Time to try again I’d say. Wow! My kids love enchiladas, I can’t wait to give them a try. This looks delicious & we always enjoy enchiladas. Thanks for the recipe! 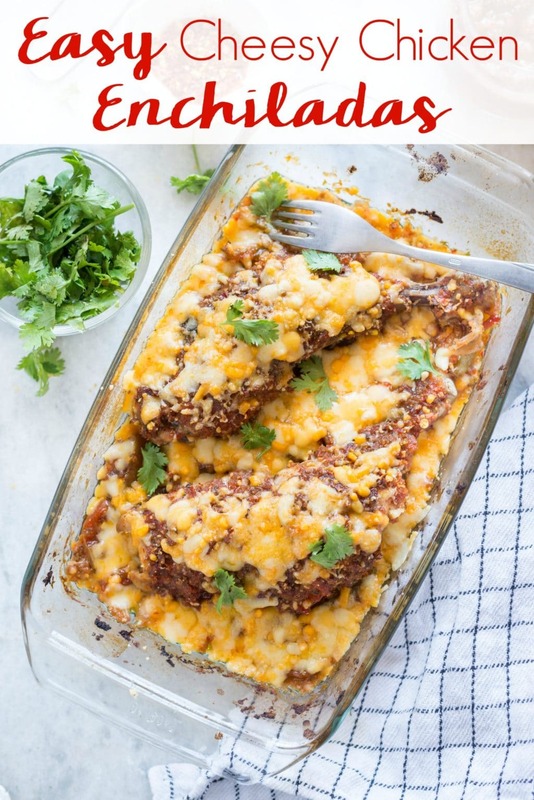 Oooo — these sound good; I haven’t have enchiladas in FOREVER. I made this last nigbt and it was very taste. Thank you for the recipe. Will be making this again. I made this because it looked good and I was not disappointed. It was delicious. Thanks for the recipe. I make this all the time!! My husband loves it! I just switch out the refried beans with cream cheese. So good! !